G4S is a British security company that helps Israel to operate prisons at which Palestinian political prisoners are held without trial and subjected to torture. G4S also provides equipment and services to illegal Israeli settlements, Israel’s apartheid Wall and the Israeli military. As this timeline shows, the campaign against G4S is having a real impact. April 2016 - UNOPS becomes third UN agency in Jordan to drop G4S following campaign. March 2016 – UNICEF in Jordan ends its contract with G4S following campaign pressure. February 2016 – Crepes & Waffles, a major restaurant chain in Colombia, decides to end a contract with G4S after a year-long BDS campaign against the multinational security company in the country. January 2016 – Students at the University of South Florida in Tampa vote to urge the university to divest from G4S. December 2015 – It emerges that UNHCR in Jordan has ended its contract with G4S following an international campaign called #UNdropG4S urging the UN to end all of its contracts with G4S. November 2015 – UK Labour party votes to end its conference security contract with G4S. August 2015 – A declaration signed by more than 1,000 Black activists, artists and scholars in solidarity with Palestinians highlights the role of G4S in Israeli and US prisons. May 2015 – The University of Helsinki in Finland cancels its security contract with G4S over its role in Israel’s prison system. April 2015 – More than 20 businesses in South Africa terminate their contracts with G4S, costing the company more than $500,000. 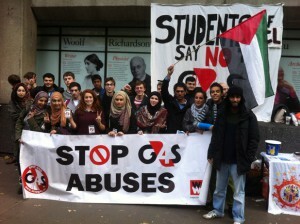 January 2015 – The student union at University College London votes to cancel its contract with G4S as soon as possible. 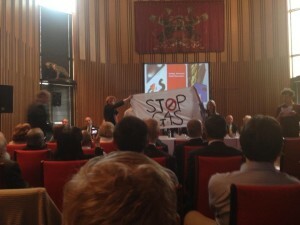 The news follows the confirmation by Essex Student Union, also in the UK, that it has cancelled its contract with G4S. November 2014 – The municipality of Durham County in North Carolina, USA, ends its contract with G4S following a campaign by local Jewish Voice for Peace activists. October 2014 – G4S loses out on a major Irish government contract following a high profile campaign by the Irish Palestine Solidarity Campaign. June 2014 – G4S announces that it “does not intend” to renew its contract with the Israeli Prison Service when it expires in 2017. Campaigns pledge to continue the campaign until G4S actually ends its support for Israeli apartheid, noting that G4S has not made any written statements on its intended withdrawal from illegal projects. June 2014 – The​ US​ United Methodist Churchdivests all G4S shares from its $20bn investment fund. The largest US Protestant Church made clear that its decision was based on G4S’ role in Israeli violations of international law. June 2014 – The UK OECD National Contact Point, a UK government body, begins an investigation into the activities of G4S in Palestine and Israel following a complaint made by Lawyers for Palestinian Human Rights. May 2014 – The Bill Gates Foundation sells the entirety of its $170m stake in G4S following aninternational campaign involving a petition launched by 100 organisations from across the world and demonstrations at the Gates Foundation’s Johannesburg, London and Seattle offices. March 2014 – The British Broadcasting Corporation elects not to award G4S an £80m ($133m) contract following a campaign supported by notable figures including film directors Ken Loach and Mike Leigh, and novelist Ahdaf Soueif. January 2014 – The student union at the University of Kent in the southeast of England votes to terminate its contract with G4S following an “outcry” over its role in human rights abuses in Palestine. December 2013 – Abvakabo, a trade union with 350,000 members in the Netherlands, ends its relationship with G4S. November 2013 – King’s College London and Southampton University opt not to award G4S major security contracts following vigorous student campaigns. November 2013 – The University of Bergen becomes the second Norwegian university to boycott with G4S, arguing that it would incur a reputational damage costing $400,000 if it contracted the company to provide campus security services. November 2013 – Cape Town based Trauma Centre cancels its contract with G4S and issues public statement opposing G4S role in Israeli prisons where Palestinians are held without trial and tortured. 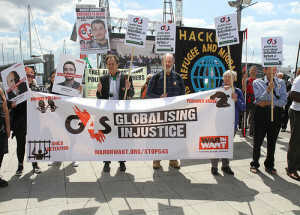 June 2013 – Protestors protest outside and disrupt the G4S shareholders meeting, pressuring the company further over its role in Israel’s prison system and apartheid policies. April 2013 – As Palestinian political prisoners refuse meals and demonstrations are held across Palestine to mark Palestinian political prisoners day, demonstrations and events areheld in 11 countries to highlight the complicity of G4S. Human rights organisations from across Egypt, Jordan and Lebanon call for a boycott of G4S and the Scottish Trade Union Congress voted to join the campaign. April 2013 – As investment analysts state that the campaign is causing “reputational issues” for G4S, the company repeats earlier pledges to pull out of a limited number of contracts in the West Bank. G4S is yet to terminate any of its operations in the West Bank and, even if it implements the cancellations it has announced, it would continue to assist with the operation of prisons inside Israel, illegal settlements and army bases. February 2013 – the students at Dundee University Students’ Association (DUSA) vote overwhelmingly in their annual general meeting to cancel their contract with G4S. February 2013 – G4S is criticised for its role in the death of Arafat Jaradat. Arafat was tortured in the Al Jalameh interrogation centre, where G4S installed and maintains the security systems. Just seven days after his arrest, he was found dead in a cell in another prison that G4S helps to run with three broken ribs, severe bruising all over his body and blood in his nose and mouth. He left behind a pregnant wife and two children. January 2013 – G4S was nominated by civil society organisations for the Public Eye’s World’s Worst Company Award for its role in Israel’s illegal dentention centers, torture facilities and prisons. January 2013 – the Umeå section of the Church of Sweden announces that it will no longer hire G4S due to its role in the occupation and Israeli prisons. December 2012 – As a result of a vibrant student campaign, the University of Oslo announces that it will terminate its contract with G4S, stating it does not want to “support companies that operate in an ethical grey area”. December 2012 – Two Dutch charities, the Food Bank in Utrecht and Jantje Beton, which promotes free outdoor play for children, announce that they will no longer cooperate with or accept donations from G4S. October 2012 – A report by UN Special Rapporteur Richard Falk criticises G4S as a prime example of a company that should be held to account for participation in Israeli violations of international law. August 2012 – Danish bank Merkur terminates its contract with G4S, citing its “involvement in the Israeli occupation of Palestine”. The news was announced during a week of creative action against the company in Denmark. August 2012 – British renewable energy firm Good Energy announces that it will end its business relationship with G4S. 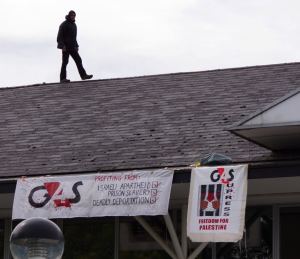 July 2012 – Activists stage a rooftop occupation at G4S’ international headquarters in West Sussex in the UK. The activists were later cleared of any criminal wrongdoing. July 2012 – Major NGO Danish Church Aid announces that it will terminate its contract with G4S. 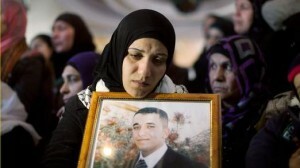 April 2012 – On the eve of a historic hunger strike by more than 2,000 Palestinian political prisoners, 13 Palestinian prisoner and human rights organisations call for a campaign to hold G4S accountable for the role it plays in maintaining Israel’s prison system. April 2012 – The European Union decides not to renew a major contract with G4S following concerns raised by a group of 28 members of the European parliament (MEPs) and civil society groups. January 2012 – Amnesty International Denmark announces it is to terminate its contract with G4S due to “because the company’s global activities do not live up to Amnesty International’s requirements for corporate action in relation to human rights”. October 2011 – the Edinburgh University Student Association (EUSA) votes overwhelmingly passed a motion through its Student Council to cancel contract with G4S. March 2011 – Responding to pressure by campaigning groups and politicians in Denmark, G4S announces that it will “aim to exit a number of contracts which involve the servicing of security equipment at…checkpoints, prisons and police stations in the West Bank”. G4S is yet to terminate any of its operations in the West Bank and, even if it implements the cancellations it has announced, it would continue to assist with the operation of prisons inside Israel, illegal settlements and army bases. Danish lawyer Hjalte Rasmussen produces a legal opinion for G4S that argues that the company is not violating international law. Dan Church Aid (DCA) and Amnesty International Denmark expressed their discontent in the Danish press about the poor quality of Rasmussen’s report, the former describing it as “shameful” as it contains so many errors. March 2011 – Research group Who Profits publish a report detailing how G4S helps to maintain Israel’s prison system, checkpoints and illegal Israeli settlements.